Last week, we had our first treasury giveaway. The theme was "My Favorite Things" and our winner, Shannon C., won a set of fabric gift tags for guessing correctly. Everyone who had the right answer, and you all did - was entered to win and we just drew names. It was so much fun, I thought I'd do it again! This week, there is a new treasury on Etsy that you can view here. All you need to do is take a look at the treasury, and come back over to the blog and leave your guess about the theme here in the comments. Even if you are not the first person to answer correctly, you will be entered to win! 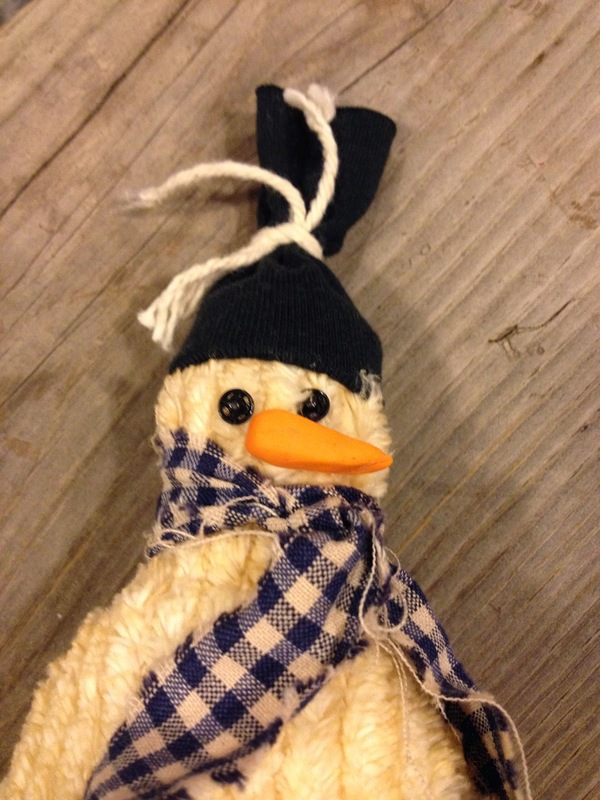 Up for grabs is this cute little snowman. He is made of tea stained chenille, and stuffed with beanbag pellets and fiberfill. He wearing a homespun scarf, and knit cap. His eyes are glued on buttons and his carrot nose is made of orange clay. He'll stand up because of the beanbag pellets. A super cute rustic winter decoration! Do you want to win a snowman? What's your guess? Winner will be picked at random by our resident 7 year old on Saturday morning! Don't forget about our first ever DLD sew-along. You can read all about it in the post below this one!